Today is all about monthly car and transportation expenses. I don't know anyone that doesn't have to pay one or the other. My car and transportation expenses are about 5% of my total monthly budget. Part of the reason this category is such a low expense for me is I don't have a car payment. As much as I would love to have a shiny new car, I am actually pretty content with my car. She turns 11 this year! She was a college graduation present and we have completed 165,000 miles together. My goal is to get to 200,000 miles! My car still runs pretty good and I think we have a few more years left together. I have really cut down on my driving since moving to a very walkable city. 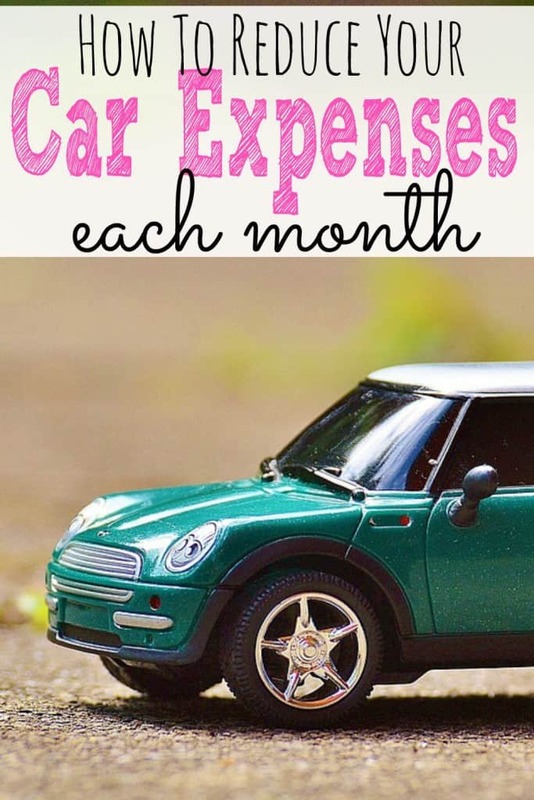 Even though I drive very few miles each month, I still have car expenses. Because parking is a premium where I live and there really isn't street parking, I have to pay to park in my apartment's garage. This expenses costs me $55 a month. I actually track this expense under my housing expense because it's part of my rent payment. This is a tough expense for me to pay but I don't really have any other options. I chalk it up to part of the city living experience. Car insurance is also significantly higher here. I am not sure if this is a west coast reason or a heavy population reason. My premium basically doubled when I moved here! I shopped around and finally found a true low mileage care insurance program with Metromile. This helped get my premium back down to what it was before moving to the city. I spend around $50 a month on car insurance. I am averaging one oil change a year, which costs around $40. I use high mileage oil so it's a little pricier than an average oil change. A tank of gas can usually last me 6-8 weeks. Gas is high on the west coast and I am glad I don't have to fill up very often! I also have really cut down on detailing my car since I moved. Back home in Florida, there was a car wash and detail on every corner. Here is Seattle people don't really seem to care about their cars as much and I think that has rubbed off on me a little. I am saving a lot of money in this area! My car does need some maintenance. I have been putting it off, mostly because I am not doing that much driving and don't feel like spending the money. I also need to buy two new tires before fall of this year. I plan on spending around $1000 this year on maintenance and 2 new tires. In addition to my car expenses, I also pay transportation costs. I ride the bus to and from work almost every day, which costs a total of $4.50 a day or $22.50 a week. Unfortunately, my work doesn't reimburse for my bus pass so I have to pay this expense. I also use Uber once or twice a month. This is a total splurge and a car service I love to use. Occasionally I'll take Uber home from work when I am just totally over riding the bus or if I'm out late with friends and have had a couple drinks. Have you ever used Uber? If not, if you use my code 1cdkj, your 1st ride is free up to $20 and I get a free ride too! I spend around $20 – $35 a month on Uber. Depending on how much money your car is worth, consider reducing insurance coverage and increasing your deductibles. I have always had the maximum deductible possible because I always knew I could up with my money if needed. I have also reduced my coverage needs as I rarely drive. Qualify for as many safe driver discounts as possible. Sometimes it's worth doing an online chat with an agent or calling your insurance provider to talk about additional discounts. Skip the emergency roadside assistance. Fortunately, I have only had 1 flat tire and managed to put the spare on with my boyfriend. Otherwise, free roadside assistance was available through 411 back home. Finally, if you have a friend or family member that can come help you out, it might actually be quicker than the roadside assistance offered through your car insurance. Combine Insurance plans. I mentioned this in a previous post, but I used to merge my homeowners insurance with my auto insurance and had significant savings. Do you have a car payment? How old is your car? No payment here, 2003 F350 and a 2012 Civic. Combining insurance is a great idea. Getting rid of comprehensive insurance once your car gets older. have you thought of giving up the car entirely for a bit? I can’t believe how many people have “windshield cover” as part of their insurance. It can often be an extra $90 a year. How many times have you had to get you windshield replaced?! When they’re only ~$200, you’ve nearly paid for a replacement every two years, simply by not taking the cover. I agree! I feel that way about insurance in general – I am not a fan of all the extra’s and fluff they try to get me for! Since making the transition to working from home, our car expenses have decreased a lot. My fiance’s job isn’t too far away, gas is now around $2/gallon, and we don’t drive around very much aside from visiting my parents. Our car insurance premiums both decreased by quite a bit when we moved as well. Maintenance is what gets me – my car is a 2002, so it will need some care this year! I got new tires last year. Because my wife and I both work a decent ways away from our home, we have a variety of car expenses such as maintenance, but gas is the biggest culprit. With that being said, the cost of gas has dropped in half over the past year so we are saving a lot of money we used to budget for gas. Lower gas prices are definitely helping with my budget too! I hope the prices stay this way for a while! I bought my car last year in cash. It’s old (1998) but the mileage is very low (I just went over 100K a few months ago) and it’s basically in very good shape. Right now my cost per month owned looks pretty high because of the initial purchase amount, but the carrying costs aren’t too bad. I budget about $100 for gas and insurance (which includes my apartment insurance) every month, and just started putting $75 a month in a repairs and maintenance sinking fund. I get the oil changed ($40 or so) about once every six months and in 18 months I’ve also paid about $450 for parts and labor over three separate repairs. Call it $135 a month for everything. Not too bad — that’s only a few dollars more per month than I paid for an unlimited metrocard in NYC. Initial costs always seem high! Hopefully your monthly average price will be lower in the long run 🙂 That’s smart to sock money away for future repairs! One oil change per year sounds awesome and I wish I could do something like that but I highly doubt it. Unfortunately the car expenses for my 2010 Hyundai are extremely high and dominate my budget. This month was extremely expensive to drive because in addition to fuel charges (I’m a heavy commuter), I’ve spent at least $700 on my car this month between the loan payment, insurance and having to get a new starter. This is just a pretty accurate estimate but I’ll add up the numbers and talk about it this week in my monthly budget review. When it rains it pours, right?! At least gas is going down 🙂 I am dreading when I take my car in to get serviced and get new tires as it’s going to cost a small fortune. At least I can plan and save for it, but I am not looking forward to it! No car payment on either of our cars- we have a 2007 Dodge Caravan and a 2009 Toyota Prius. We probably only need one car, but we haven’t bothered to sell my minivan because it is paid off and not worth much! Insurance on it is super cheap too. Sometimes it’s better to keep it than to sell! Isn’t it great not having a car payment? I dread the day I have to worry about shopping for a car!